The studio with the loft was a great value for five people. The breakfast was good and it was very nice to have a full array of cookware for other meals. The location is good too because it is close to many attractions, but in a quieter neighborhood. The room was super nice and clean. It was very close to a nice bakery, restaurant and within walking distance of the waterfront. The housekeepers are very polite, always greeted me with a smile and the greeting of the day. The owner helped me out numerous times, but calling me taxi's and talking with tour agencies. She was my Shero. Great spot for a short or long stay in the city. Quiet area yet close to the center of the city. Highly recommended! The location was perfect and quiet. Very helpful staff, Fast internet. 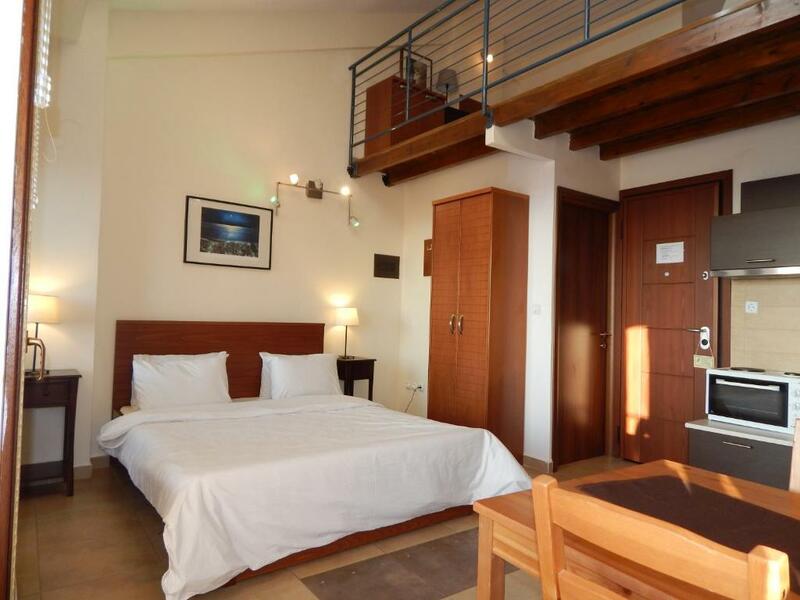 Large studio with confortable beds and facilities. Loved the cake on arrival, the easy pick-up of keys. Liked the explanations and tips for restaurants, walks around, and other information left in the room. Thankful to the owner/manager who gave us even more information and ordered us a taxi to the airpot. We enjoyed breakfast on the balcony every morning. The lady, Mrs Olga Samou definitely takes being a host seriously. She laid on a beautiful breakfast buffet, which I forgotten about. It was the best sight to see in the morning. Also the Netflix on the TV was a bonus, as my daughter managed to catch up with Teenwolf,I also kept up with my Tai Chi on YouTube. So thumbs up all round. The room was very big and had everything we needed. Lovely host and a lot of recommendations for the city. We would definitely recommend the accommodation. 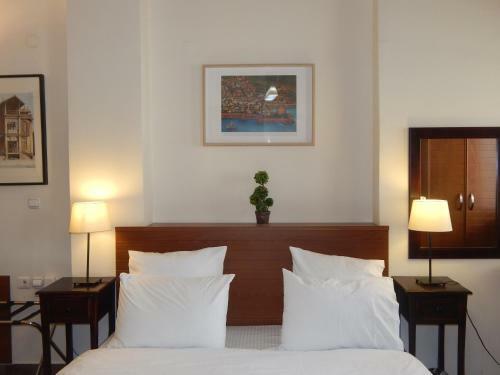 Lock in a great price for Kripis Studio Thessaloniki – rated 8.9 by recent guests! Located in the traditional part of Thessaloniki City, Kripis Studio offers self-catering accommodations studios, each with a balcony. Free WiFi is available in all areas. Byzantine churches and museums are a 5-minute walk away. Opening to a balcony, all studios and apartments will provide you with a flat-screen TV and air conditioning. Guests can prepare their meals in the privacy of their own accommodations, using their fully equipped kitchen. Featuring a bath or shower, private bathroom comes with a hairdryer, slippers and free toiletries. An iron and iron board are available upon request. Breakfast buffet is served daily. Coffee facilities are available in every room. The nearest bus stop is at a distance of a few yards, while an array of tavernas and cafes, as well as a mini market are within walking distance. Agios Dimitrios Church is a 10-minute walk away and Aristotelous Square is 1.1 mi away. Makedonia International Airport is a 20-minute drive away. When would you like to stay at Kripis Studio Thessaloniki? -a bathroom with a shower cabin, hairdryer and free toiletries. A microwave, iron and iron board is available under request. Kindly note that there is no elevator in the building. Kindly note that this room type can accommodate an extra bed, upon charge. -a bathroom with shower, hairdryer and free toiletries. A microwave, iron and iron board are available upon request. -a bathroom with a small bath, hairdryer and free toiletries. A microwave and ironing facilities are available upon request. Please note that the 4th guest is accommodated in a bed, stored under the single bed. Due to ground inclination, this room type is located in both the ground floor and the basement depending on access point. Kindly note that this room type can accommodate an extra bed, upon request and at extra charge. A free baby cot for a child up to 2 years old can be provided upon request (see hotel policies). Our small apart hotel has five studios with a kitchen to prepare breakfast and small meals. The apartments are available as single, double and quadruple. Breakfast buffet is served in the reception area, daily, 8.30am - 10.30am. Use a dish from your room to transport your breakfast items. In your room, you can prepare your coffee. (Greek coffee, Nescafe, or tea). It is possible in some rooms to add another bed, as well as baby cot. 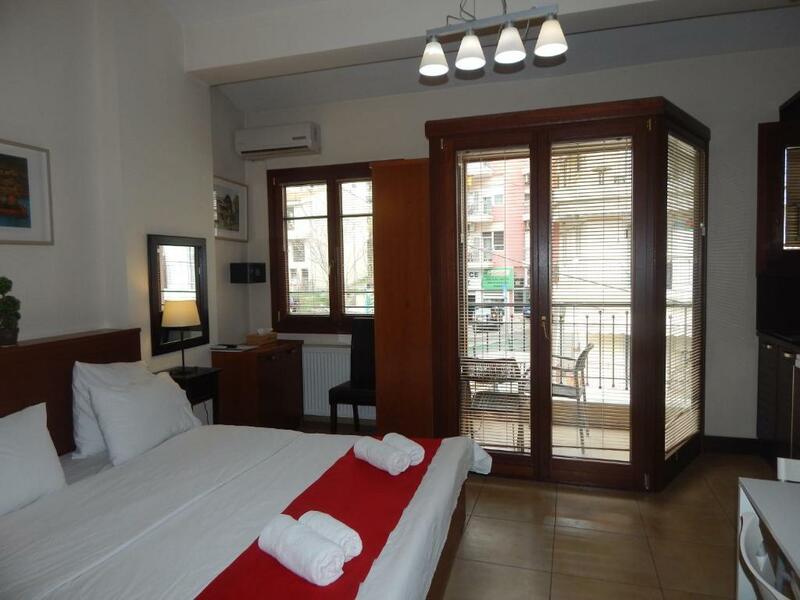 This extended stay hotel is located in Old Town in Thessaloniki in an area of traditional houses. We live and work with our family in Thessaloniki. We love this city and we will try to help you find out the best things to do! Usually I do not meet my guest, but I am allways arround and I answer to all the mails and phones. If you have any questions feel free to ask! House Rules Kripis Studio Thessaloniki takes special requests – add in the next step! Please note that a baby cot can be provided upon request in all studios. Please note that a children's highchair with safety belt can be provided upon request. Please note that guests receive an SMS with a code for entering the building. Kindly note that there is no reception for the entire day. If there is nobody in reception, the customer enters with a code and instructions are provided via email. When you get inside you will find your key, over the reception table. In the entrance, there is also a phone where you can call customer service for free 24 hours per day. Please inform Kripis Studio Thessaloniki of your expected arrival time in advance. You can use the Special Requests box when booking, or contact the property directly using the contact details in your confirmation. In our room no. 1, from boiler were sometime leaking water on the floor in bathroom, there was no dish dryer and we suggest to move microwave oven to some shelf up to ensure more space in kitchen, also main door from street to Kripis apartments were left open as lock was not working properly. There was no parking space. The okay Things we didn't like was the bathroom . What I mean with this is although you could really see that the room and the hotel over all was pretty clean and cared the bathroom had this very bad smell and I would recommend to do something for that. That's the only thing that didn't really feel welcoming . As soon as I booked my room I received 3 or 4 emails that explained everything one tourist would like to know for staying in one area . I was send a welcome email and an email with directions and a map just to make sure I know where my destination is . After that I received an email about how to go in where my Keyes are located how to get them , contact numbers ect . I really liked the area and the neighbourhood ! Although it's really hard to park your car somewhere near the hotel but that's fine . I really liked the kitchen facility and the balcony we had . The room over all was very cosy and that's what I really expect when I'm staying at a hotel . Location in Ano Polis. Coffee and pastries as a compliment. On a hill.......which turned out great. Clean friendly place in old town. Fabulous location in a really interesting area.